A few weeks ago I fell in love with Balanced Guru and their amazing body scrub. 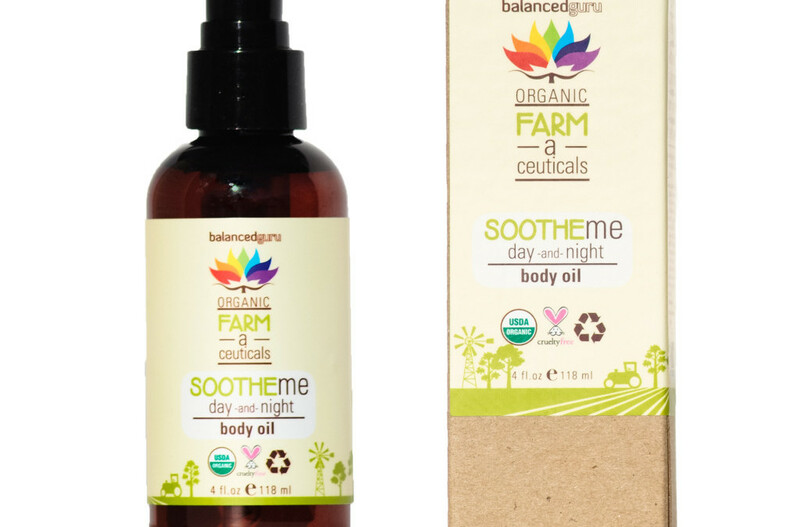 I’m all about natural, safe, and effective means of getting gorgeous — and they obviously fit the bill which is why when I got to try their Sooth Me Day and Night Body Oil, I totally flipped! I have a slight obsession with body oils because they make me feel so luxurious. This body oil contains some lovely botanicals and natural skin pampering ingredients. What does Balanced Guru have to say? Organic body oil good for all skin types. Moisturize and soothe your skin without leaving a greasy feeling with a blend of fast absorbing nourishing oils. Enriched with a blend of Olive Oil, Avocado Oil, Jojoba Oil and Arnica extract and encapsulated Shiitake Mushrooms and Goji Berries. Safe for expecting mothers, nursing mothers and children. This oil does not have a scent which is nice because it can be easily used as a base moisturizer and won’t compete with your perfumes. It’s silky, soft, and absorbs quickly so using this during the day before work or school, or even as an evening moisture boost is simple. I’ve used this as a body oil, cuticle oil, and as an after-shaving balm (which many of you know is a big review factor for me). This made my legs feel pampered and soft after shaving and prevented me from getting any types of bumps or irritation that comes with shaving. This, for me, is a must-have product to prep for summer. How does it work with its sister scrub? Amazing! Sooth Me is a perfect complement to their Scrub Me product. I loved exfoliating and then moisturizing my skin following my bath or shower. Best of all? This product is natural and cruelty free!